FILE - Health workers spray insecticide to combat the Aedes aegypti mosquito that transmits the Zika virus in Rio de Janeiro, Brazil, Jan. 26, 2016. The mosquito-borne Zika virus "won't be a problem" in Rio de Janiero during the summer Olympic Games, according to Olympic Committee CEO Sidney Levy. "All the statistics show that in the winter months, the Zika mosquito doesn't proliferate," he told VOA's Carol Castiel in an interview conducted by in Washington. It is now winter in the southern hemisphere, where temperatures in Celsius are dipping into the high teens. Early this month, a group of 150 doctors, scientists and bioethicists wrote a letter to the World Health Organization calling for the Olympics, which begin Aug. 4, to be moved or postponed out of fear the Zika virus could spread. Several high-profile athletes, such as Irish golfer Rory Mcllroy and American basketball legend Lebron James of the Cleveland Cavaliers, have decided not to compete in Rio out of concern for the virus. "I now have 4,000 people that are working currently in the venues, in the parks and on the beaches in T-shirts, and I have not a single case of Zika," Levy said. He also cited a study from Cambridge University which said the chance of getting the virus during the games is one in 1 million. Officials began spraying for mosquitoes in Rio months ago. "We are going to continue doing that during the games," Levy said. "We think we have much bigger issues than that." Among those problems are transportation and security. "We are receiving a lot of people, so those issues are much higher on our list," Levy said. The public transportation system has undergone a major transformation for the Olympics. New subway lines, new highways, and new light trains and buses have been added to the system. Before the games, only 15 percent of the city's population used public transportation. Levy expects that number to jump to 65 percent with the new additions that the games will leave for the people of Rio de Janiero. "The main question is, ‘Why do the games?’ It is just one answer, ‘What can the games do for your city?’ That is what really [matters]. 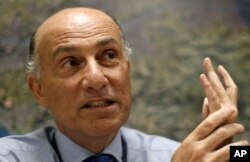 And we decided to do a major transformation of the public transportation system," Levy said. FILE - Members of Brazil's Battalion of Special Operations participate during a crisis simulation exercise to show the media how security will be provided during the 2016 Olympics at the Golf Olympic bus station in Rio de Janeiro, Brazil, Feb. 11, 2015. Security for the games will be at an all-time high. The city of 6.3 million people is expecting an additional 500,000 visitors for the games. There will be 85,000 security personnel in the city, and Rio will be receiving information from more than 100 intelligence agencies worldwide. When it comes to security, says Levy, Rio has had a lot of practice from hosting the World Cup and the pope's visit – when an estimated 2 million people were in the streets. "In both occasions, we use the same system we will be using for the games," Levy said. But, he says, the one area organizers fell short is in water quality. "There are five competition areas around the bay [Guanabara], and we are tracking them every day," he said. "What I can tell you now is that four of them are absolutely clear; one of them we are not that sure. And if we feel it is not good enough, we will change the venue," Levy said. 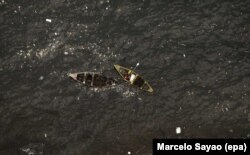 FILE – Fishermen are shown amid floating garbage in Guanabara Bay, where the sailing competitions at the 2016 Rio Olympic Games will be held, in Rio de Janeiro, Brazil, May 21, 2016. Prior to the involvement of the International Olympic Committee, 20 percent of the sewage flowing into Guanabara Bay – where some events will be held – was being cleaned. The IOC promised to raise that to 80 percent, but fell short – only 50 percent is currently being cleaned. "We are going to run the competition and no athlete is going to get sick,” Levy said. “But we failed to clean the water for the population afterward." Cleaning the rest will be up to future leaders, he told VOA.